A cellular store worker had a gun placed to her head by men who forced her into the shop’s bathroom during a robbery Saturday evening. 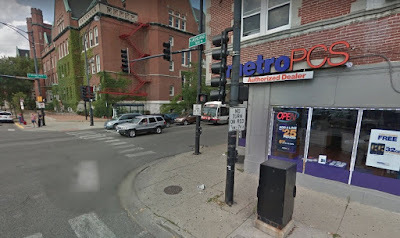 The hold-up took place at Metro PCS, 3961 North Ashland, directly across the street from Lakeview High School. No one was injured. Just before 6 p.m., two men entered the store and forced the clerk into the bathroom at gunpoint, police said. The robbers then took the woman’s backpack, cash, and at least two cell phones. They ran out of the store as a customer walked in, according to a police report. • Male, black, dark complexion, beard, 5’9” tall, husky, baggy pants, and backpack. • Male, black, light complexion, long curly hair, sunglasses, and jeans. Metro PCS is at least the third cellular store to be struck by robbers or thieves in the 19th Police District since late March. On March 30, two male juveniles entered a cellular store at 1958 West Irving Park Road and began helping themselves to merchandise shortly after noon. One of the offenders was carrying a knife. The duo escaped with ten new phones. Both thieves were male, black, 13- to 15-years-old, and dressed in green, according to a witness. Then, a T-mobile store at 1973 West Lawrence was struck around 4:30 p.m. on March 31. In that case, three teenagers entered the store, stole a collection of cell phones, and ran out the door. Police caught up with the trio about 15 minutes later in the 4600 block of North Winchester. No further information was available about the arrestees because they are under 18-years-old.